After a series of kitchen disasters, during which several new dishes went straight into the bin, I tend to cook and bake things that are well known to me and disaster-proof. Like granola. Apart from the fact that it is still my favorite breakfast, it just feels good to pull something out of the oven that’s edible. With my granolas, I have experienced a lot with all sorts of flavor combination (as you can see by the length on my granola list). I think I get the proportions right between oats, crunchy nuts and seeds and some coconut sprinkles, and I know how to get it nice and crunchy and full of flavor. 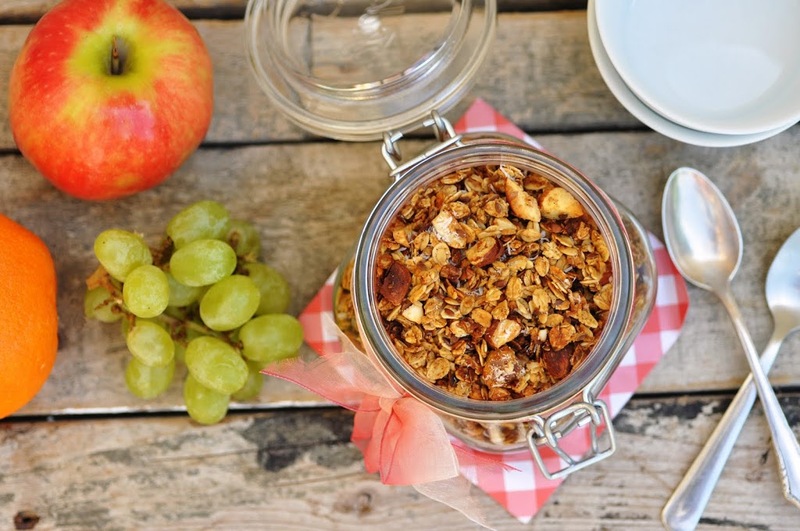 I like my granola not too sweet and with as many healthy ingredients as possible. This orange cinnamon granola is in fact not too sweet. It only contains a few tablespoon of sweetener. I used date syrup (check this recipe to make your own). The flavors of orange and cinnamon dominate without being overpowering. It’s further made with olive oil instead of vegetable oil. And that’s all there is. Oats are a well-known health food, that keeps the blood sugar stable, is full of anti-oxidants and insoluble fibre. Flax seeds, almonds and hazelnuts contain lots of healthy fats and vitamin E.
Just good for you and tasty. Preheat oven to 165C/350F. Line large baking sheet with parchment paper. In a large bowl, combine oats, chopped nuts and flax seeds. Set aside. In a small pot, combine orange juice, zest, syrup/honey, oil and cinnamon. Heat gently and let sit for 5 minutes for the flavors to merge. Pour the orange mixture over the oat mixture and stir until well coated. Spread out in single layer onto the baking sheet. Bake for about 25 minutes or until lightly browned. Let cool completely. Stir in desiccated coconut and dried fruit, if you choose to use them. Store in airtight container.